I hate commercial radio; inane chat, repetitive pop music, and endless advertisements just aren’t my thing. On the other hand, commercial-free public radio seems to spend its time on political controversy, death and destruction, cooking shows, gardening, and a whole lot of other topics I just don’t want to listen to. The science and technology shows and other gems I’d really enjoy all seem to be buried at times when I don’t, can’t, or would prefer not to be listening to the radio. And when does any mainstream medium get around to exploring the huge diversity of our human existence? They don’t; they all broadcast the same tired old safe and “normal” content. In the old days, people with divergent interests or points of view could set up their own radio or TV station—if they had thousands of dollars to spare and a lot of knowhow. But now, thanks to the Internet and some very clever software, anyone can share her point of view, her music, her passion, with a worldwide audience of one, one hundred, or one hundred million with ease and at a very low cost. Podcasts have changed my life. My iTunes library now includes content from overseas radio stations and other providers I would otherwise have no chance of hearing. At last I can listen to content that interests me, when and where I want and as often as I want. My passions have been engaged, childhood interests revived, and my personal community extended far beyond its previous boundaries. My life has been in the humanities, but I’m a closet scientist at heart. I don’t know much—my all-time lowest school grade was for chemistry (or was it Latin? )—but I’m interested in science and technology. Luckily for me there are some excellent podcasts on just those topics. NetNewsWire downloads them to iTunes for me, I plug in my iPod, grab the dog, and head out for our daily walk. Sometimes I play podcasts straight from my PowerBook while I’m working or doing household chores. Thank goodness for AirTunes and a cheap set of external speakers. My favorite podcasts include both professional and amateur contributions. What I’ve found from experience though is that sound quality needs to be high. I quickly unsubscribed from a few podcasts whose content is worthwhile but whose audio quality just hurt my ears. Podictionary, 2-minute explorations of the history of words in our vocabulary. Slacker Astronomy, 5–10 minutes long, comes from three US astronomers each week, with occasional extra shows of up to an hour. Quirks and Quarks is a Canadian show covering the “latest in science, technology, medicine and the environment.” Each week’s one hour show is split into half a dozen segments so you can listen to them individually. BBC Go Digital from the UK is a “weekly BBC World Service programme that looks at how technology is changing our lives.” These are generally about 25 minutes. Screencasts Online, provides free hints, tips, and video tutorials for Mac users. Most are between 10 and 30 minutes. Manager Tools, 30–60 minutes each week about how to be a great manager. If I were in management this would be an essential podcast, but I’m not, so it’s just one of my favorites, chock full of really useful information about business relationships. TWIT (This Week in Tech) brings former TechTV host Leo Laporte together with colleagues such as Patrick Norton and John C. Dvorak to chat about current issues and events in the world of technology, especially computing. The weekly shows are commonly an hour or more. They are available as audio-only or video. Unfortunately I’ve had to unsubscribe from podcasts teaching Chinese, Russian, and Japanese as I just didn’t have time to keep up, but as a former teacher of German I can only say: I wish podcasts had been around when I was learning and teaching other languages! If you’re using a dial-up connection to the Internet you’ll want to choose short podcasts or they’ll just take too long to download. If you have broadband then check your bandwidth allowance—although the podcasts will download quickly you may well exceed your monthly limit if you choose too many. The shortest podcast I know of is the daily Podictionary at about two minutes. That’s a couple of megabytes. Over the course of a month that could add up to between 50 and 75 MB. In the last month I’ve downloaded about 1 GB of podcasts, adding up to a massive 36 hours of listening. That’s a lot of content and if you just keep downloading and adding podcasts to iTunes you may soon fill up your hard drive. It also becomes hard to find the content you haven’t yet listened to. I handle these problems with a few smart playlists and some rating techniques. Although iTunes and my iPod both add a play count and a date for when a track was last played I find that information sometimes just mysteriously disappears. I like to rate each track I’ve finished listening to with a single star. If I have to stop listening in the middle of a track I rate it two stars. I reserve three stars and above for rating music. I generally choose my podcast listening by duration. A 30-minute walk needs a 30-minute podcast; while listening in bed just before I go to sleep is ideal for a podcast less than five minutes. Cleaning windows and other household tasks suit longer podcasts or a series of shorter ones. I have several smart playlists set up so I can go directly to podcasts within certain time bands: 0 to 5 minutes, 5 to 15 minutes, 15 to 30 minutes, 30 to 45 minutes, and more than 45 minutes. The playlist pulls up podcasts whose rating is not one star. Other criteria filter out music and otherwise restrict the results to the genres I want to include. After all, podcasting isn’t a genre; it’s a delivery mechanism. Most of the podcasts I listen to are transitory; once I’ve listened to them I’m extremely unlikely to listen again. Others, like language learning podcasts, may need repeated listening. Some tracks may be good to keep as a reference or perhaps to burn to CD and pass to friends. I like to keep the Manager Tools podcasts, the videos showing tips and techniques for using my Mac, and some 1950s sci-fi radio shows (Spaceship Radio). The ones I want to keep I mark with the word Keeper at the start of the Comments. See Doug’s Applescripts for iTunes for an AppleScript to speed that up. Sometimes the RSS feeds providing the podcasts have a glitch and I end up with a second copy of one or more iTunes tracks. For this reason I like to keep tracks I’ve listened to around for a few weeks so I can more easily identify when this duplication has occurred. 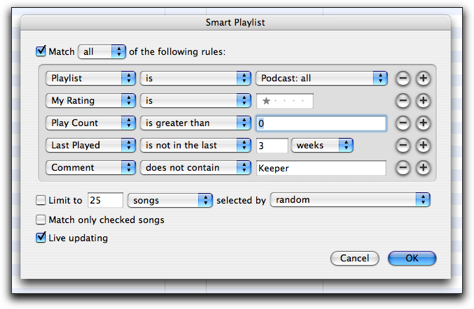 I set up a smart playlist to pull up all podcasts that have a rating of one star, a play count greater than 0, which were last played more than 3 weeks ago, and whose comment does not contain the word Keeper. Every couple of days I look at that smart playlist, select all the tracks and choose Command-Option-Delete to remove both the track listing and the original sound file. 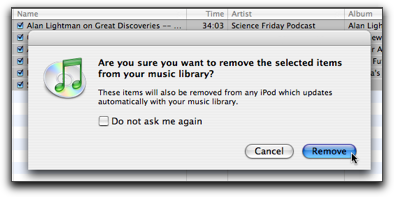 Remove tracks from iTunes library. Move tracks to the Trash. Podcasts have transformed my listening and learning. While I could just watch and listen to them on my computer, my iPod (or any MP3 player) has provided immense flexibility. I listen to podcasts while walking, before I go to sleep, while lounging on the deck in the sun, in the car via my car stereo, while doing housework, and at many other times. Instead of despairingly hearing some chat about wine or gardening just because it’s on, or missing the radio lecture on the development of New Zealand English because I’m walking the dog, I can now choose what I’m interested in and when to listen to it. I have access to a vast diversity of amateur and professional content in whatever languages I speak. There seem to be podcasts to cover every interest. In January 2006 Podcast Alley listed almost 13,000 separate podcasts. Provided the audio quality is good, I’m thrilled to listen to genuine passionate content even if it is a bit raw. Radio program controllers seem to think we should be exposed to endless world conflict interspersed with numbing pap. Thanks to podcasts I have liberated my listening. Copyright © 2005 Miraz Jordan. Miraz is a writer and web designer in Wellington, New Zealand. Want to write about your iPod experiences in a Pod People column? Contact us at editor@atpm.com. Hi Miraz - good podcast list. Are you having trouble accessing Quirks and Quarks? I continually get message about Technical Difficulties - driving me crazy. Thanks, Dave. I had problems all through my recent summer break, but it seems to be working again now.